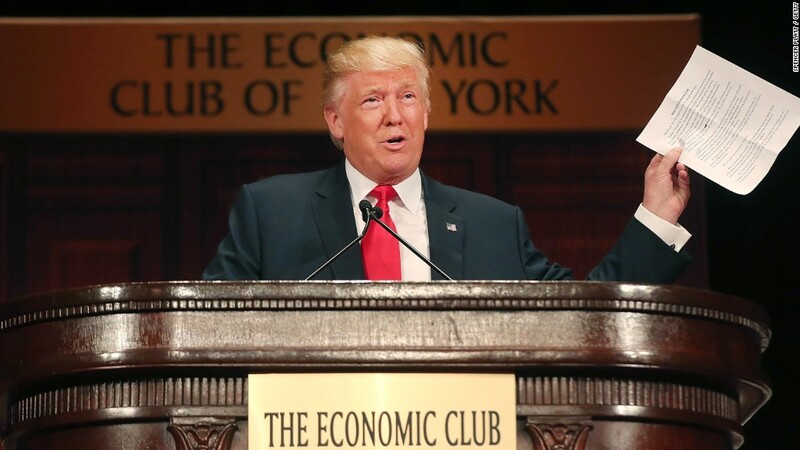 Donald Trump is fond of saying Americans are living through the worst recovery in modern times. He blames President Obama for the sluggish economy and claims he can do far better. "Now look, we have the worst revival of an economy since the Great Depression," Trump said in the first debate. His running mate Mike Pence mentioned it in the vice presidential debate Tuesday night. Trump is right if you look solely at the average rate of growth during this rebound versus prior ones. "In terms of the average pace of GDP growth, this is the slowest expansion on record," says Lakshman Achuthan, co-founder of the Economic Cycle Research Institute. The U.S. economy has only grown 2% a year since it bottomed out in June 2009. 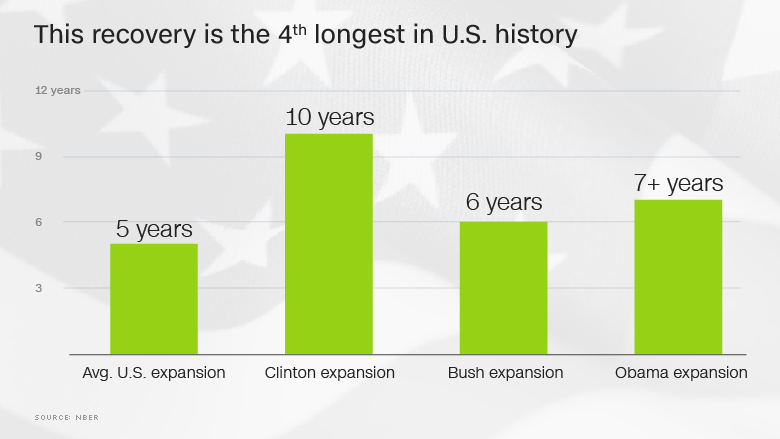 That's far below the typical growth in rosy times of over 4% a year that the U.S. has experienced since World War II. It's even below the rather sluggish rebound during President George W. Bush's tenure of 2.7%. So it's a fair statement. There is data to back up Trump's claim (at least since just after World War II when the government started keeping quarterly records), but it comes with a big asterisk. Plenty of experts say "hold on." This recovery may be slow, but it's also lasted a long time -- far longer than usual -- and job growth has been good. "We are in the fourth longest expansion in U.S. history," notes Achuthan. Since World War II, the American economy has typically grown for about five years and then had a contraction. This expansion is already over seven years old. 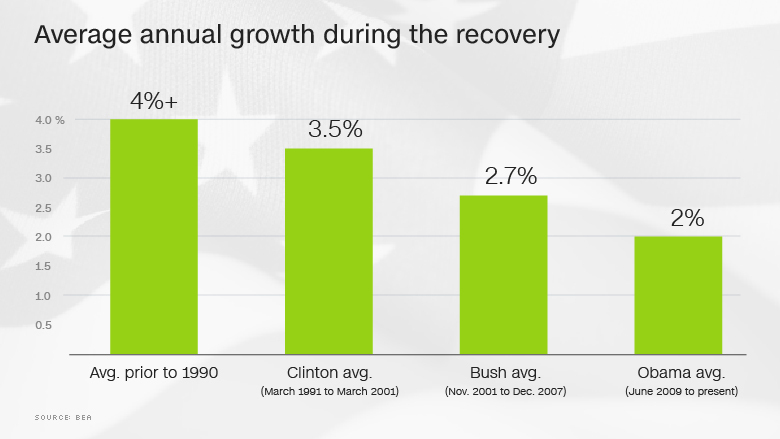 Furthermore, the average pace of job growth in this recovery has already topped what happened during the 2001 to 2007 expansion under President George W. Bush (the Bush recovery was the slowest in terms of jobs growth, Achuthan says). Over 14 million jobs have been added since the low point from the financial crisis. Job growth is as important -- if not more important -- than overall growth, many economists argue. "We are experiencing the longest string of consecutive monthly jobs gains in economic history," says Mark Zandi, chief economist at Moody's Analytics. Then there's the fact that the U.S. had to climb out of the deepest hole since the Great Depression. While growth has been slow, it's been a lot better in the U.S. than in Europe and Japan. Plus, the economy has dragged as the U.S. as Baby Boomers have begun to retire. There simply aren't as many people working as there once were. Growth overall has been slowing in America since the 1970s as the population ages and productivity stalled. Economist Ed Yardeni of Yardeni Research put together over 20 pages of charts comparing this recovery to prior ones. He calls this "one of the weakest" recoveries, but he's hesitant to dub it the absolute worst once you look across a wide range of metrics.